« Buying things. Returning things. Can’t even buy a bag without rage and a nervous breakdown…!! Back in April, I had an impending New York trip looming (ahh… those pre-holiday days were the days… the excitement, the plane films, the G&Ts..). 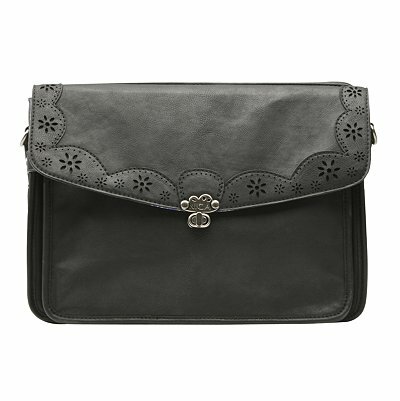 As I was without a handbag (that I liked), I panic-bought this pretty little satchel style bag from Nica at Topshop. It appeared to be roomy, but not so roomy that you’d never find anything, functional, but not so functional that it was ugly, and hard-wearing but not so hard-wearing that it looked…hard-wearing. Unfortunately, I was wrong. Despite appearences, the bag was too small to carry daily basics without having to fit them in like Tetris pieces, the strap was sooo long that I had to tie a knot in it, and most annoyingly, the catch didn’t always close properly so there was a constant danger of scattering your belongings everywhere…ARG! Still… I struggled on with it, until the damn thing broke a week ago. Good riddance. But the mental bag scarring lives on… now I’m plagued with bad-bag memories and fears. 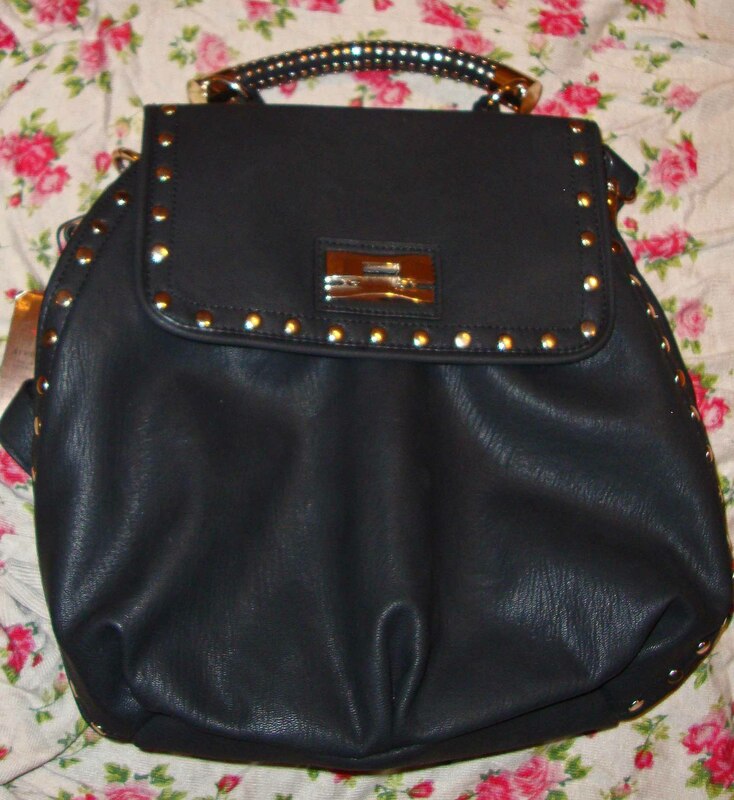 Will this rather hot looking faux leather and gold studded number from River Island be as infuriating? 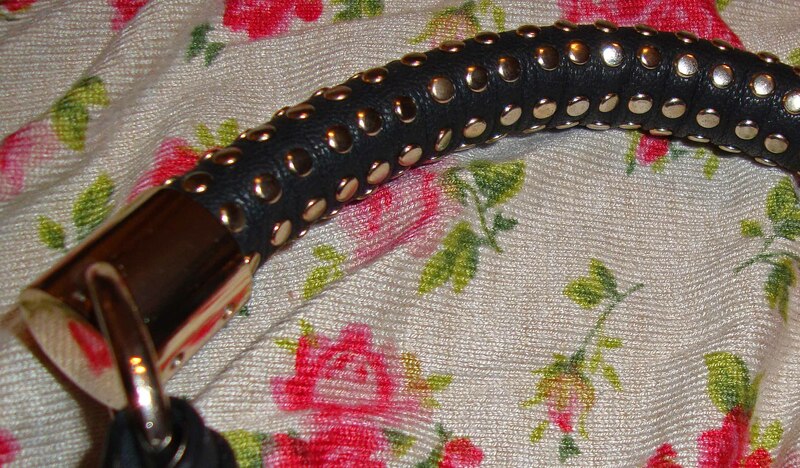 I love the combination of gold studs on the black background, but I’m not sure I could handle the fiddly lock. Will it be another thing that pushes me to rage on a daily basis? And as much as I’m drawn to the heavily studded handle, I’m not sure I’d ever be able to use it to carry the bag, as it attaches directly onto the closing flap and seems to be unsupported. I’m not sure the faux leather would be able to hold the weight… hmm. 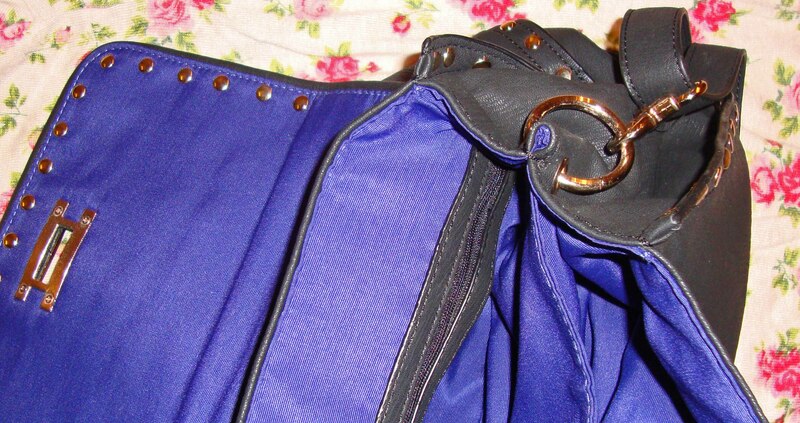 I can find no faults with the bright indigo lining, but can I really keep a bag based on the secret bit that no one sees? !